A Mohawk group of people relocated to Muskoka area in 1881 from the Kanesatake, Oka, Quebec. 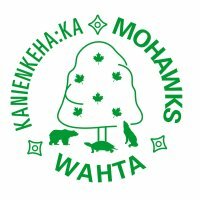 The Wahta Mohawks are mainly descended from Mohawks who were members of the Five Nations confederacy, which also included the Oneida, Onondaga, Cayuga and Seneca. When the Tuscarora joined in the in the early 1700’s they became the Six Nations Confederacy. The Mohawk Nation is the Eastern Door of the Iroquois Confederacy. It was responsible for protecting its easternmost territory, the trade relationship with the Dutch and later the English trade center at what is now Albany, New York.The Confederacy had a long-standing reputation among other Indigenous Nations and European colonists for its sophisticated political organization and its complex use of diplomacy and coordinated military campaigns. The Confederacy still exists and the People continue to refer to themselves as Haudenosaunee or People of the Longhouse. Today there are eight communities that comprise the Mohawk Nation: Akwesasne, Kahnawake, Kanesatake, Six Nations, Tyendinaga and Wahta as well as Kanatsiohareke and Ganienke in the United States.